David Murray is of course one of the more important tenor saxophonists of his era – or make that any era. Judging by his extensive discography, he is ready to collaborate or engage in almost any musical project. Never one to rest on his many accomplishments, any recording with Murray is worth investigating. This release is no exception, although certainly it would not be the best place to begin one’s Murray research. 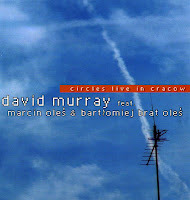 For this collaboration, Murray connects with two brothers, bassist Marcin and drummer Bartlomiej Brat Oles, during a special concert with “Poland’s finest rhythm section”. This live show was recorded in Cracow as part of a festival and, as the liners state, Murray was thoroughly on board with this partnership, despite the fact that there apparently wasn’t much rehearsal time. As a result, many of the compositions present space for a blowing session of sorts, with modal vamps being the vehicle for the group’s interaction. Fortunately, Murray and the brothers sound like they enjoy one another’s company, with the brothers working as full partners whether out in front or in support mode. The trio plays seven compositions here, with four by drummer Bartlomiej, one from the bassist Marcin, one from Murray, and Ornette Coleman’s “Law Years”. The concert commences with “Go Home”, Bartlomiej’s modal piece focusing on buoyant groove set by Bartlomiej, with the tension rising as Murray draws upon the dark, spiritual vibes with trademark altissimo musings. It initially starts off tentatively. However, the musicians eventually land on thair feet. Next up is “Double Tone”, a feature for Murray’s bass clarinetand bassist’s Marcin hard swinging post Bop waves. “Circles” is meant as a feature for all three musicians, with Murray taking the bandto the stratosphere, as the youngsters follow his lead. Both Murray’s piece “Mbizo” and Ornette’s “Law Years”capture the variable rhythms and sonic connection between the brothers that inspired Murray to participate. While this is certainly not essential Murray, it demostrates his continuing vitality in interaction on an international level. The Oles brothers are worthy partners and do their part in an effort to make exciting and worthy music. Rafał Mazur & Keir Neuringer on European tour!! !